The Brigade Commander, 35 Artillery Brigade, Nigeria Army, Alamara, Abeokuta, Basil Adoke, has said ‘Operation Crocodile Smiles’ will be launched soon in Ogun State. Adoke made this known at the Government House in Abeokuta, the Ogun State capital, in his remarks during the cutting of the 57th Independence Day anniversary cake. 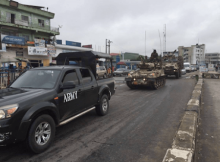 The Brigade Commander advised residents of the state and visitors, not to panic with the imminent commencement of the exercise. He said though the state is “relatively peaceful,” there was also the need to sustain the peace. “Operation Crocodile smiles will take care of miscreants and nobody should panic or entertain fear about it except miscreants. There is relative peace in Ogun State but the peace should also be sustained,” Adoke added.